Line a baking tray with parchment paper or greaseproof paper. Put the yogurt, milk and sugar in a pan and warm until hand-hot, alternatively heat in a small bowl on low power for 40 seconds in the microwave. The sugar should melt into the yogurt and milk. Place the flour, baking powder, ginger powder and butter into a mixing bowl and rub the butter into the flour to make a breadcrumb texture. Using a wooden spoon add the warmed yogurt mix and stir well to form a dough. Dust the worktop with some flour and bring the dough together. Gently roll out the dough to about 3cm thick and with a round 7cm cutter push out the scones. Place the scones on the prepared tray with a good distance between them. Re-shape the dough and cut again. 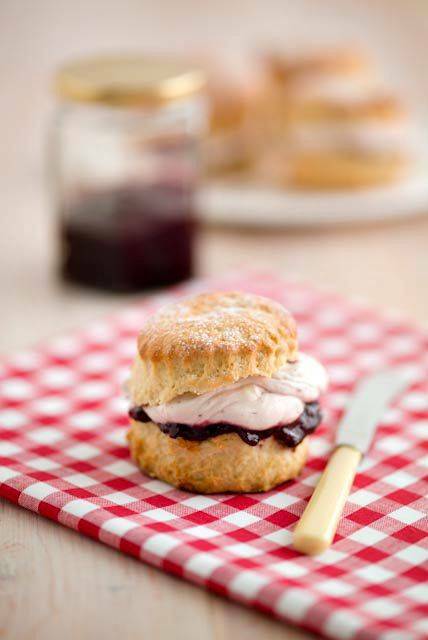 Brush each scone with a little milk and bake for 10-15 minutes until golden brown. Cool on a wire rack and sandwich with a mixture of jam, whipped cream and cherry yogurt to serve. "Portuguese Banana Yogurt Cake: Afternoon Tea Recipe"